This system is a visual enhancement for Kread-EX's Ar Tonelico CBS v.1.1, that adds a dynamic camera and a mode7 styled battleground. The file "MGC_SVBM7.dll" is necessary. The instructions can be found at the beginning of the script. In short, you have to associate tilesets identifiers to pictures used to render the battlefield : the ground and battlebacks. As this this an add-on for Kread's script, you can't distribute the demo unless you contact him. See this topic for more information. Minkoff/DerVVulfman for the Animated Battlers script. ressources: Dollmage, Nakka, BlackMask, Grin (battlers), MoyasiWhite (icons) and Gozaru (face graphics). See this topic for more precision. I'm sorry but could you upload the scripts somewhere other than mediafire? Everytime I try to download them mediafire freezes and the download never starts. It's been doing this to me lately. Don't use megaupload either if you add another download link because it does the same. Thank you in advance. I added sendspace links. Does it work ? Yes they work, thank you. Wouldn't hurt to put an add-on where you can see the enemy/boss HP bar though. 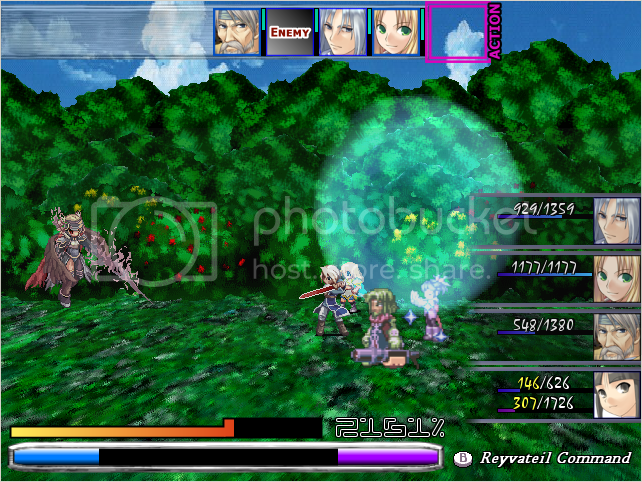 xnadvance Wrote: Wouldn't hurt to put an add-on where you can see the enemy/boss HP bar though. You mean, always ? Because the HP bar is visible when you select an enemy. - when I start demo, I choose continue then choose file to load, demo crash, too.